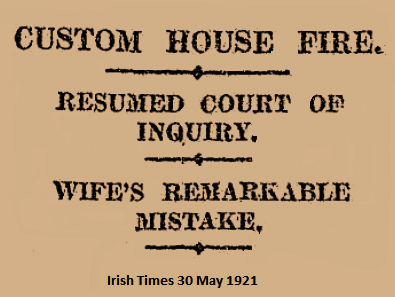 In a celebrated case of mistaken identity, good news for one family turned into tragedy for another after the attack on the Custom House. “James Connolly (37), 26 Gardiner Street, quay labourer and ex-soldier and sailor. Shot at entrance to Gardiner Street and Beresford Place. Leaves a widow and 5 children, the eldest of who is only 11 years” [This related to James Kelly]. “James Kelly (63), Gardiner Street, quay labourer. Married, no children. He was shot near the railway bridge when going to Dinner” [Relates to James Connolly whose story is here]. One paper later took great delight in reporting an error by somebody else – Mrs Bridget Kelly who’d identified a corpse at King George V (now St Bricin’s) Military Hospital as her own husband and later had to inform the military inquiry she’d made a mistake. “He looked just like my man”……. Bridget, who lived very near the Custom House at 9 Lower Gardiner Street, explained that on 25 May she’d been told by an excited neighbour he’d seen her husband lying dead, shot and bayoneted, on the building’s plaza. The poor woman rushed to the military hospital, identified a body as her husband James and then arranged a habit for the corpse and the funeral. Later she received what would’ve been a common note in such days of widespread daily arrests. It came from Arbour Hill barracks, said I’m under arrest but OK – and asked for a pipe and some tobacco. It was from a very much alive James, her hubby. Wiser second time round she went to the barracks and had the guard send a challenging note to James – name their 5 children in the correct order, with ages! Getting the right response she was at last certain her own husband hadn’t been a casualty. It’s not recorded if James got his smoking gear. Nor do we have any hint of their conversation when the couple finally met in Arbour Hill on the Sunday following the Burning…… A great pity! At the inquiry Mrs Kelly had to admit her original sworn identification was wrong and she didn’t know who the dead man was. Even the inquiry president, a British officer, showed some understanding and humanity when he discharged her, reportedly saying he was very glad she’d been mistaken and that he had no need to detain her further at the court. James Kelly of 9 Gardiner Street does appear on the list of men arrested at the Custom House. However, it’s not clear if he was in the IRA. As we know, several civilians were rounded up after the Burning who had nothing to do with it and were not released for some time in many cases. 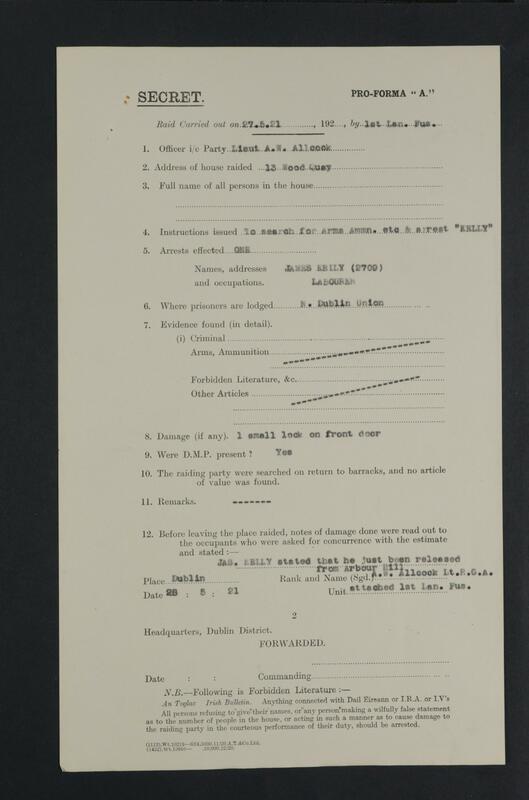 A Crown forces report dated 27th May stated James Kelly (2709), Labourer was found at 13 Wood Quay during a raid for arms, ammo & to arrest “Kelly”. The 1st Lancs Fusiliers officer in charge recorded Kelly said “I have only just been released from Arbour Hill”. He was taken to North Dublin Union (sited at Grangegorman and then an Auxy base) for detention this time. He was later interned in Kilmainham and appears on the prisoner list with the rest of the Custom House Fire Brigade. It is not certain if James Kelly was actually an IRA member; hopefully a future military pension file release may clarify that. He died aged 80 in 1967 at 33 Lr Gardiner St and is buried in Glasnevin. There was no family death notice or obit and his burial record says he was a Labourer. A daughter who died at eleven in 1944 lies in the same grave along with her mother Bridget who passed away in 1975. Her death notice mentioned James’ name but nothing about his past. So, what else is known about James Kelly? From his 1911 census form he was born in Dublin about 1883, married Bridget Nelson in the Pro-Cathedral in 1909 and by 1921 had 5 kids (more followed later). In her 1921 sworn statement, Bridget said James was aged about 38, had served for a short period in the navy during the Great War and before that was 13 years in the Connaught Rangers, including combat in the Boer War. She added he was a casual Coal Labourer but was out of work on 25 May. Possibly he was around the Custom House quays looking for work that day, even though lunchtime was late in the day to be seeking “a start”. Or was with his comrades on the Custom House attack. Dublin port was a famous place for nicknames – you’d wonder was James nicknamed Lazarus after his return from the dead? Or was the slagging even worse for his missus! 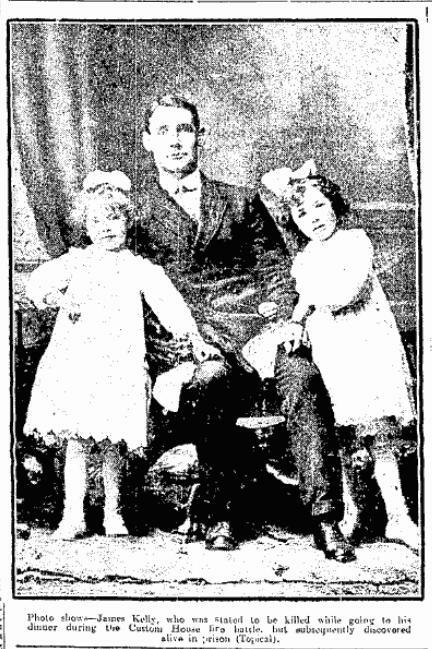 A photo of James with two of his daughters Annie & Mary appeared in the Cork Examiner of the time. So, a happy ending for the Kelly family. But, when death is involved that usually means bad news for another family and so it proved in this case. The story also shows how a person can achieve his/her “15 minutes of fame” or “celeb status” through strange and sometimes amusing circumstances. We can thank Bridget Kelly’s unfortunate slip for a glimpse into the life and times of her family. The body wrongly identified turned out to be that of a totally innocent civilian accidentally shot, John Byrne. His story is here. A bizarre coincidence to end the story. James Kelly’s wife was originally Bridget Nelson. In 1915, another Bridget Nelson married a John Byrne. The same name as the man whose body was confused with James Kelly in 1921. Not the same man killed at the Custom House, but a scary foreboding of the future….? ?